A day spent with the smell of oil, grease and steam. I spent yesterday at the London Model Engineering Exhibition. It’s the showcase model engineering event in Southern England and a must-attend show if you’re a mechanical modelling enthusiast. Although most exhibits and traders were naturally showing or selling items of the more mechanical nature, there was also a large contingent of plastic models on display and even a couple of N gauge layouts if you looked carefully. More common were fully operational model boats, planes, stationary steam engines and of course larger gauge trains. In fact, trains made up quite a few of the 2,000 exhibits, fans of Gauge 1 and Gauge 3 seemed particularly well supported. 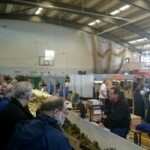 The highlight for me was the Hornby Live Steam OO gauge models on the OO Live Steam Club stand. 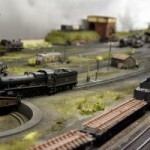 These were fully operational steam locomotives in OO scale. Hornby made a while back but sadly no longer sell them. This is a shame because they’re fantastic engines to watch racing around their track. Watching steam puff out from an OO scale train and knowing it’s real steam and not just some chemically induced substance — as is usually the case for this scale — gave me a warm glow and not just from the heat of the locomotives. My brief video below, shot at the exhibition, below shows them in action, along with some of the other trains on display. The Gauge 1 Association was also there, showing their amazing live steam gauge one locomotives. I have to admit to just standing gawping at these for longer than I should. The sight and sound of these fully operational, miniature, steam locomotives was just wonderful. Alongside these were all manner of garden sized steam and diesel trains on display. Most of these weren’t running. There was also an impressive Lego train layout (also in the video above) by Brickish (a UK-wide community of adult fans of LEGO – AFOLs). The Lego Rocket was delightful and impressively detailed for a Lego model. I had hoped to see some exhibits with Sterling Engines or Mamod and have a chat about my sterling locomotive project but couldn’t find any. There were, however, plenty of locomotive engineers floating around and I got some good ideas and tips. And those glorious Hornby live steam trains… A future project perhaps?